My loving wife, Peggy Zerba was diagnosed with congestive heart failure in 2006. Since then she has had a defibrillator installed on her heart, was diagnosed with cardiomyopathy, has a leaking mitral valve. She is going to get a LVAD pump to keep her alive while she waits for a life-saving heart transplant. The cost of this transplant can be overwhelming. Peggy is a loving mother of our children, Jennifer and Jason. She is a sister, aunt, active in the community and good friend to many. She ran a daycare for many years. Although she tires very easily she loves to sew and garden. Family is the most important to her. Once she receives her transplant she looks forward to being able to spend more time in her garden and more time enjoying life. Peggy is a very kind person and is always willing to help others. Now she is the one who needs your help. Even with excellent insurance there are many expenses that are not covered and must be paid out of pocket. Some of these are copays, deductibles, lab fees, travel back and forth to the transplant center and Peggy will be on a life-time of very expensive anti-rejection medications. This is where your support is needed. To help with the financial burden of Peggy’s uninsured expenses a fund raising campaign in her honor has been established with Help Hope Live, a trusted nonprofit organization that has been providing community-based fundraising guidance to patients and their families for more than 30 years. All donations are tax-deductible to the full extent allowed by law, are held by Help Hope Live in the Great-Lakes Heart Transplant Fund, and are administered by Help Hope Live for transplant-related expenses only. To make a donation to this fundraising campaign, click on the Donate Now button. On behalf of Peggy, our families and myself, thank you for your ongoing kindness, generosity, support and prayers. Keep an eye on this Help Hope Live campaign page because we will be planning some fundraising events soon and posting updates regularly. Great News!! Part of the process of being listed on the transplant list is the doctors can move you up to the 1A position at their discretion. They would do this when there is no competition for the same heart. Even though Peggy’s condition has not worsened the doctors have chosen to upgrade her as of today. She will remain at this level for 30 days unless she gets a heart sooner. After the 30 days she will once again be listed at a 1B. This means she now has a greater chance at getting a heart in the next 30 days. It doesn’t mean it will happen but her chances are better. Please continue to pray for Peggy and Joe as well. It is difficult waiting. More updates as they become available. GREAT NEWS!!! Peggy has been activated on the transplant list. She is currently listed as a 1B which means she is on an LVAD and doing well. Nobody knows when a heart will be available. More information will be posted as time goes on. Please continue to pray for Peggy and Joe too. Please sign the guest book on this page and let her know you are thinking about her. On behalf of Joe, Peggy and the entire family, we thank you for your love and support. Over the past 2 weeks Peggy has had a CT scan and heart cath. She also had an LVAD checkup yesterday. It went well. She now will be meeting with the surgeon next week. After that meeting the team of doctors will confur and hopefully we will have a decision by the end of next week. Please continue to pray for the doctors and for Peggy. Good News!!! Peggy has reached the pretest stage to determine her eligibility for the transplant. After the tests she will meet with the doctors and then a determination will be made if they will activate her. Also, fundraising efforts are still continuing. We have secured a venue and will be having a fundraiser on February 10, 2018 at the Holland Fish & Game Club. More information will be forthcoming when available. Peggy continues to do her best at following doctors orders. She is taking life day by day. Lately she has been doing quite well. We are hopeful that soon the doctors will activate her on the transplant registry. In April Peggy spent a week in the hospital dealing with issues. On August 21 she once again had a shock by her defibrillator. She was taken to ER and was admitted to the hospital. The doctors said that the right side of her heart is not keeping up with the left ehich is the side with the pump. When this happens her heart goes into atrial fibrillation which causes the defibrillator to shock her. Everytime this happens her heart gets weaker. The family met with the transplant team and we have some things that need to be addressed prior to listing her. Peggy returned home on Aug 23. Since the initial posting of Peggy’s HHL page much has happened. The summer and fall of 2016 was spent going to doctor’s appointments, changing medications and having many tests. Finally it was decided that it would help Peggy to have a mitral valve clip put in to help with her breathing. On December 14, 2016 she had the procedure. It helped for a period of time but after a couple weeks she once again started to have breathing issues. During the early morning of February 5, 2017 Peggy’s defibrillator went off multiple times. She was admitted into the hospital that day for what was to become a very long stay. The doctors were trying to decide the best route for her. They finally came to the conclusion that she would need to have the VAD installed on February 24, 2017. The surgery was very long and complicated. Due to these complications they had to open the sternum. The sternum was kept open (skin closed). It was closed with another operation 2 days later. Her recovery was difficult. Once out of ICU she would return a couple times for issues she was having. Finally, on March 27 she was discharged to return home. Unfortunately, she once again would return to the hospital on April 7 and is still there. Her spirits are good and she is anxious to return home again. Praying for that heart, the old one and the new. The two of you are what good people are made of. We love you both. 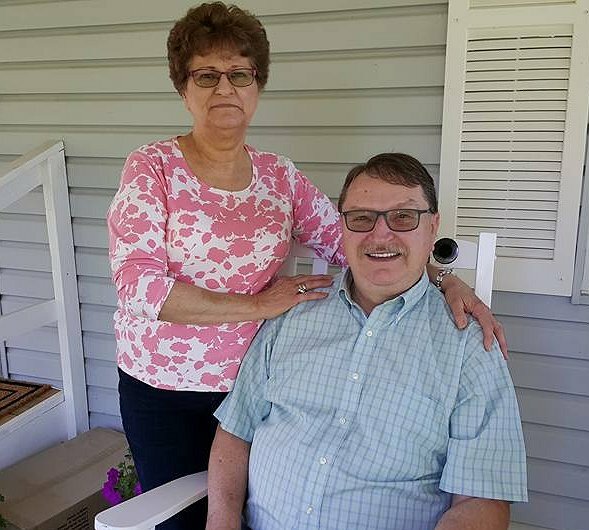 Peg and Joe, we pray daily for you and know waiting is unbearable. God will provide sooner than you think and then its all uphill, a hill you will climb with success. Love you guys to the end of time. So glad to hear things are moving in the right direction! Continued prayers for you during this journey. Love you! How wonderful Aunt Peggy.. We love you..
Joella, and your sister Nellie..
wow, activated on the transplant list at long last! Please God let everything and everybody work perfectly! We love you mom. Whatever you need please don't hesitate to ask. You are the best!! !